Know your worth, build on your passions and use failure as an advantage. 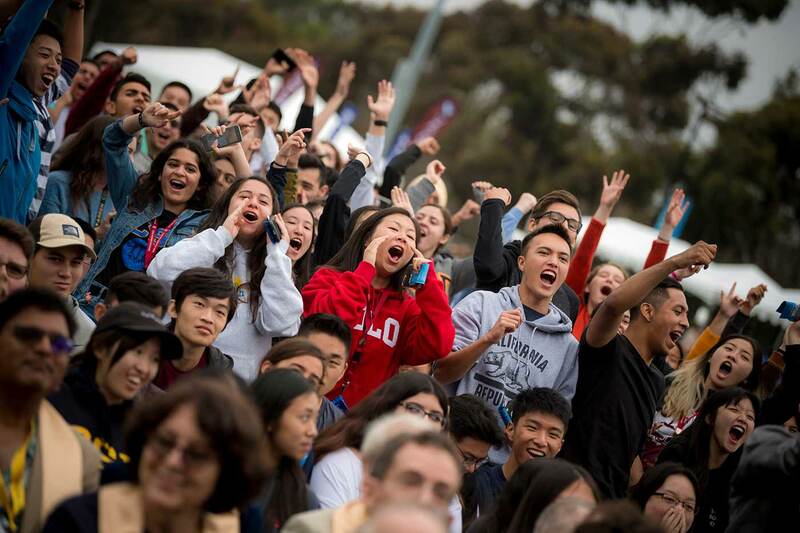 These were some of the messages delivered to approximately 9,000 new students last week at Convocation—the annual ceremony marking incoming students’ official entrance to the UC San Diego community. 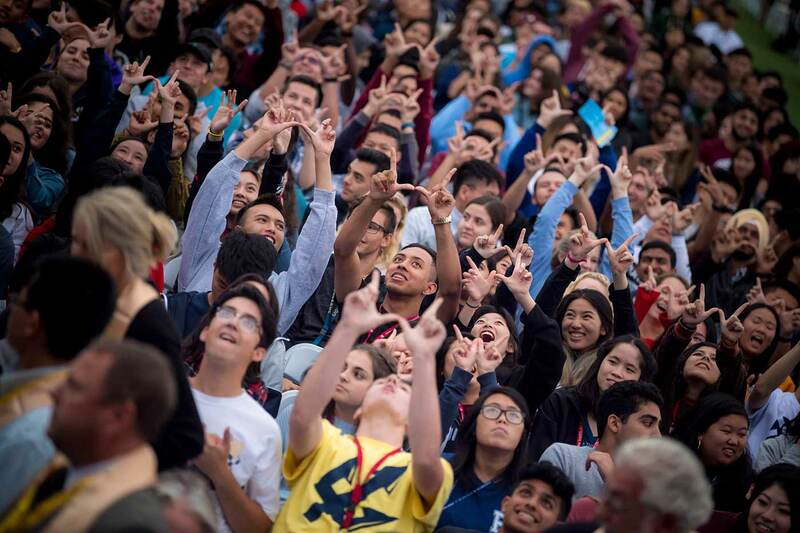 The event, which kicked off more than 150 Welcome Week events, included an address from Chancellor Pradeep K. Khosla. 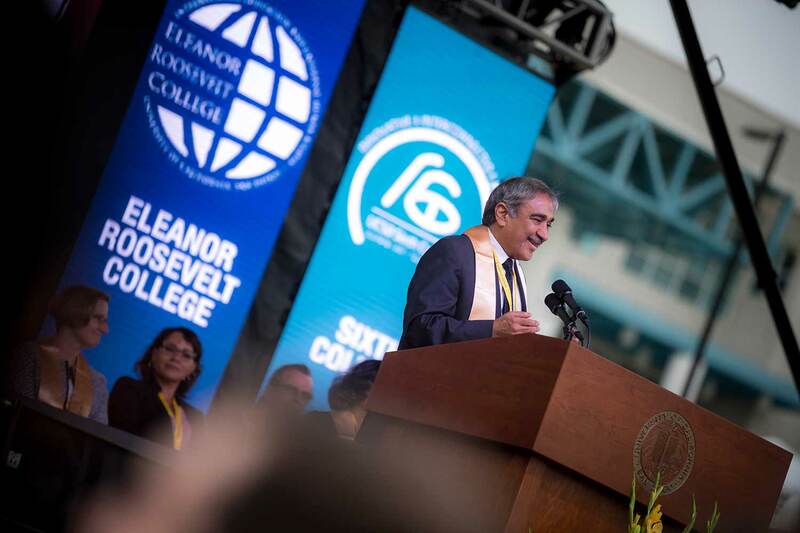 Chancellor Pradeep K. Khosla addressed UC San Diego’s record, incoming class. Anita Raj, Tata Chancellor Professor of Medicine, who holds a joint appointment with Education Studies, and is director of UC San Diego's Center on Gender Equity and Health served as the Convocation keynote speaker. 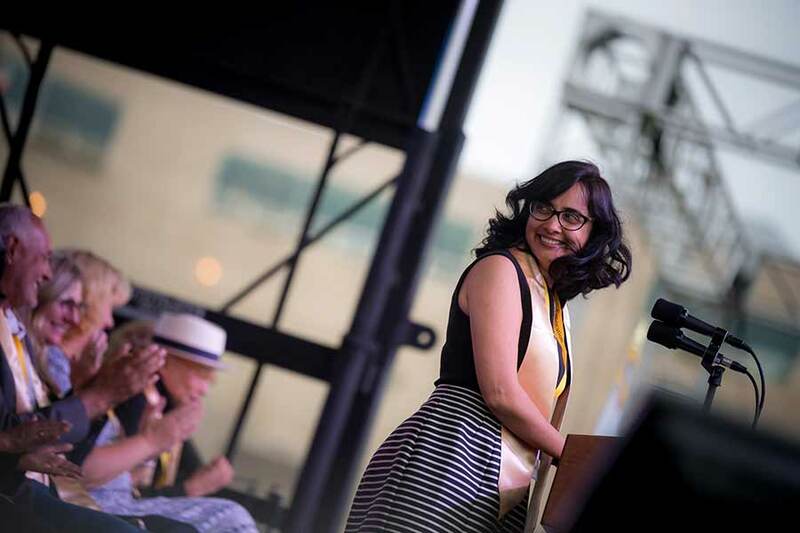 Addressing the thousands of new freshmen and transfers in attendance, Raj imparted the lessons she learned from her college experience, encouraging students as they start an exciting new chapter in their lives as UC San Diego Tritons. Raj also eased some of the anxieties new students may have as they start school at one of the most prestigious universities in the world. Raj then went on the share the three greatest lessons she learned during her formative years. Lesson #1: Know and value who you are, not just who you aspire to be. Raj spoke about how she had to learn this lesson the hard way. Entering college at the young age of 16, she made friends quickly because, as she quipped “it was finally cool to be smart.” However, she wanted to distinguish herself even more, so she decided to speak with a fake British accent to mask her Mississippi drawl. After getting called out for speaking with a suspicious-sounding cadence, she was mortified. Months later, her studies also got away from her and she eventually had to transfer to another college. Students from all six colleges attended the event. Her attempt to recreate herself forced her to face a new and profound truth—she was more than just grades and she did not need to change her identity to “fit in” or be accepted. Lesson #2: Build on your passions, not just your goals. After transferring to a smaller college closer to home at the age of 18, Raj made a bold choice to explore her interests, even though it didn’t quite align with her original goal of being a doctor. Her grades improved and she started receiving more positive feedback from her professors. During her senior year, she auditioned and got the lead in “The Diary of Anne Frank.” After receiving standing ovations following her performance, she realized she did not want to take the MCATs and go to medical school. Rather, she could create her own path, merging her love of the social sciences and medical research. Following the ceremony, students had dinner on the RIMAC field. Today, Raj, who is trained as a developmental psychologist, is a leading expert in the evaluation of sexual, reproductive and maternal-child behavioral health for socially vulnerable populations, among other topics. Her work has also inspired her students, many of whom have gone on to conduct prestigious research in the same field, some of whom now work with the World Health Organization. Lesson #3: Failure happens to everyone. Success is the ability to learn and move past it. Raj’s own path to success was paved with missteps and, at times, failure; however, she believes she wouldn’t be where she is today if she hadn’t been humbled and educated by these experiences. With that, Raj encouraged students to seek support from their peers, mentors and professors, and to not be afraid to seek guidance and ask for help. She concluded her speech with an optimistic message, empowering students who all have the ability to be future innovators and problem-solvers. 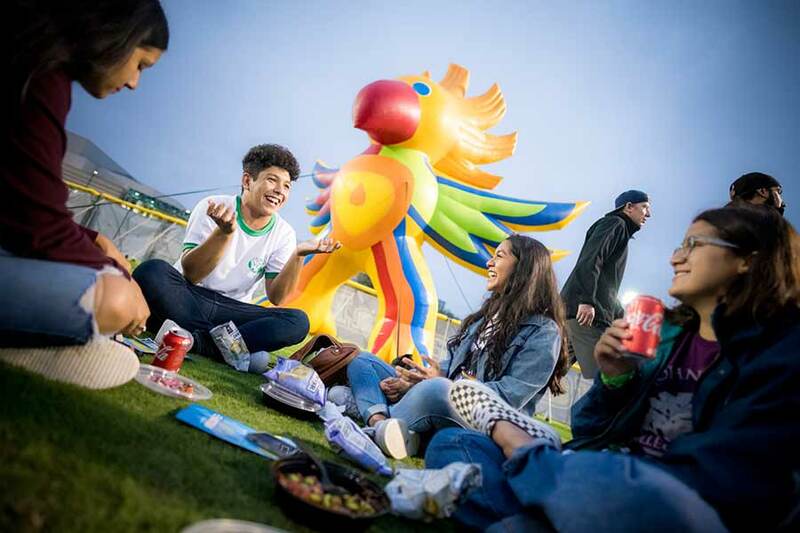 Following the event, students enjoyed dinner on RIMAC field where they had the opportunity to connect and interact with faculty—a key component of UC San Diego’s welcome to all new students.